This fully furnished rental property can accommodate large families or groups, offering spacious accommodation with all modern conveniences including your own private swimming pool with Jacuzzi to help you enjoy your holiday. This rental property is situated on the beautiful Black Sea coast, the town of Byala with its crystal blue sea and sandy beaches, is becoming a much sought after residential area. 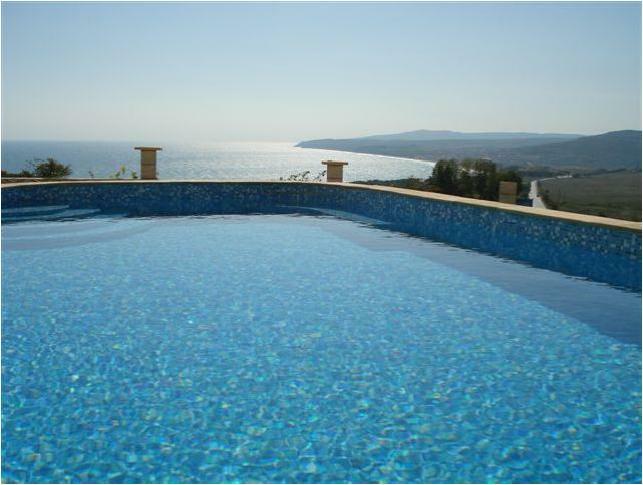 The house also offers a sun terrace where you can enjoy the outstanding views towards Obzor and beyond. Swim in your own pool or just laze on one of the many sun loungers around the garden and admire the panoramic views of the Black Sea, watching the ships and yachts set sail across part of the former Byzantine Empire. This rental villa with almost 300 sq. m living space has 4 bedrooms and 4 bathrooms. It has cable TV with English and other language programs. It also benefits from a security system and driveway for four cars. There is a pool table which should keep everyone entertained. Byala village is a popular holiday spot for Bulgarians and so has a great selection of restaurants, cafes and bars, all of which are extremely low-priced. Only 50 km south from the Bulgarian Sea capital Varna and lying just 80 km north of the town of Bourgas, its panoramic views make it the perfect spot for a flexible holiday. There are many beaches in the vicinity, some of them still virgin and unknown for most of the people. The northern beach is famous for its fine white sand and beautiful lagoons. The central beach is the most preferable one because it appeals to many tourists has many restaurants, water-slides and other attractions. The southern beach is the most interesting one where the yacht port is and you can moor your boat here. This is the only port in the vicinity. Many tourists who have visited Byala compare it to the French Riviera probably because it is located in hilly area and opens wonderful views to the sea with unbelievable sunsets and sunrises. The last hills of Balkan Mountain rise only 6 km south of Byala. This gives the combination of mountain and sea views and it makes this place very unique. For large groups over 10 people we offer the villa next door (ID 9022) on a discounted price!! !